Engaging local stakeholders is essential to the success of any public health initiative. 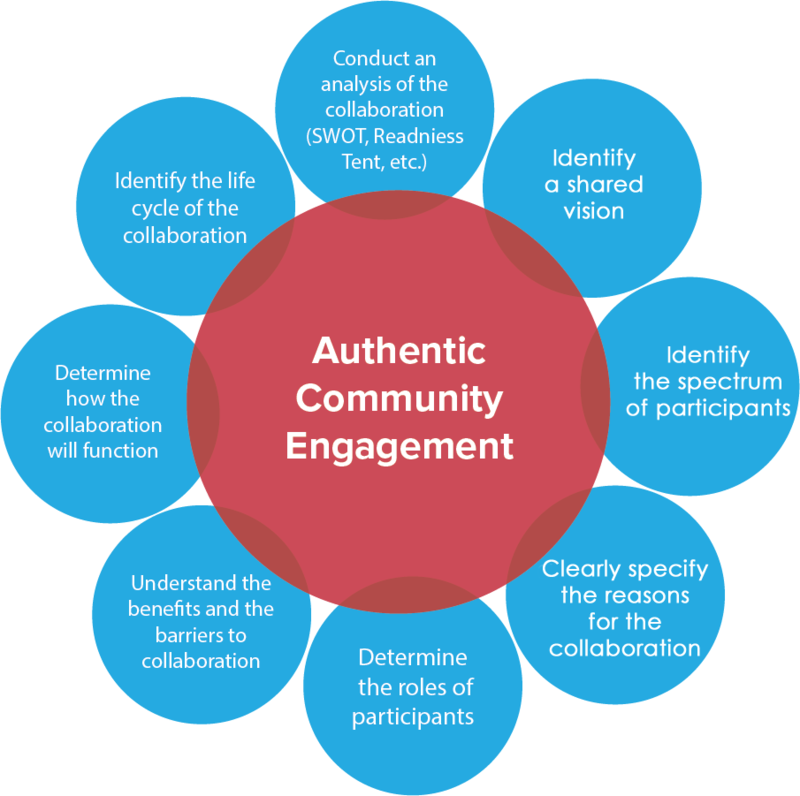 True community engagement means involving community members in all activities—from identifying the relevant issues and making decisions about how to address them to evaluating and sharing the results with the community. Consider using a broad definition of “community” to include not only the community members affected by the initiative, but also those with a broader stake in the outcomes. These stake holders can include academic institutions, educational systems, health insurance companies, the juvenile justice system, faith-based institutions, health care systems, youth coalitions, and fraternal organizations. 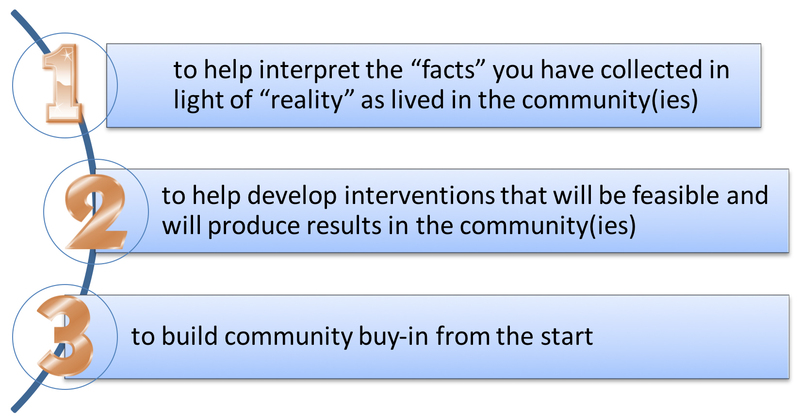 The following topics will lead you through steps needed to engage the community. Please use the Read More links to learn about each step and for additional resources. In the READY section you learned that, when planning to share your data with community members and stakeholders, you must “tell the story”. You also learned that telling the story is more than presenting the local MCH data which you have located and analyzed. Click Read More below for reasons and ideas to tell the story of your local data and intended initiatives. There are three purposes for telling the story of your local data and intended initiatives. Clearly state the problem in terms of observable fact: “infant mortality rate is three times as high among Black mothers as among White mothers,” “prematurity accounts for 80% of Black excess deaths”. Provide examples of hypothesized causal relationships that can explain these findings, and examples of evidence based programs that can address the underlying causes: Make it clear that these are examples, and invite your audience(s) to question and interpret all of this information based on their lived experience or other information they may have. Example interpretation: “Unmarried mothers in our Black community tend to be young women with grandparents in poverty, so we feel that in our community being unmarried is a proxy for intergenerational poverty. Can the data confirm this?” The health department or any stakeholder may provide information (related to the above problems and prevention areas) from multiple sources including local data, local case studies, expert opinion, scientific knowledge, and evaluations of programs/interventions. This list is by no means exhaustive, and CityMatCH recognizes that many experts and resources exist outside of this list. Chao, S. M., Donatoni, G., Bemis, C., Donovan, K., Harding, C., Davenport, D., Gilbert, C., Kasehagen, L., Peck, M. G. (2010). Integrated approaches to improve birth outcomes: Perinatal periods of risk, infant mortality review, and the Los Angeles mommy and baby project. Maternal and Child Health Journal, 14(6), 827-837. Peck, M. G., Sappenfield, W. M., & Skala, J. (2010.) Perinatal periods of risk: A community approach for using data to improve women and infants’ health. Maternal and Child Health Journal, 14(6), 864-874. Sappenfield, W. M., Peck, M. G., Gilbert, C. S., Haynatzka, V. R., Bryant, T 3rd. (2010). Perinatal periods of risk: Analytic preparation and phase 1 analytic methods for investigating feto-infant mortality. Maternal and Child Health Journal, 14(6), 838-850. Sappenfield, W. M., Peck, M. G., Gilbert, C. S., Haynatzka, V. R., Bryant, T 3rd. (2010). Perinatal periods of risk: Phase 2 analytic methods for further investigating feto-infant mortality. Maternal and Child Health Journal, 14(6), 851-863. Telling Engaging Stories with Data. (2016). Live Stories. Champions come in all shapes and sizes, and influence in any number of ways. One thing they all have in common is that they are advocates for an issue, a community, a policy, etc. In the field of public health, a champion will most likely be someone with influence in the health care field, certain communities, or political realm. Your coalition should also think outside the box as there can be champions in the unlikeliest of places and people! To read more about identifying and engaging public health champions, click Read More. FHI 360. (2010). Engaging innovative advocates as public health champions [Brief]. Durham, NC: Author. Rabin BA, Brownson RC, Haire-Joshu D, et al. (2008). A glossary for dissemination and implementation research in health. Journal of Public Health Management and Practice, 14, 117–23. The Collective Impact approach depends on the cohesiveness of a team. In the SET stage, your coalition will continue to develop a common agenda, and will revise it with community members as needed. Through this activity, coalition members will learn and understand others’ perspectives on the community or communities most pressing health issues and bring diverse stakeholders to a common mission, set of goals, and measurements toward success. To review the conditions of Collective Impact, click HERE. To discover tools to use with your coalition, click on Read More below. Hanleybrown, F., Kania, J., & Kramer, M. (2012). Channeling change: Making collective impact work. Stanford Social Innovation Review, 20, 1-8. Minnesota Department of Health. (n.d.). Community engagement. Ogden, C. (2015). Networks, collective impact, and waking up to whiteness. Bergstrom, D., Rose, K., Olinger, J., Holley, K. (2012). The sustainable communities initiative: The community engagement guide for sustainable communities.